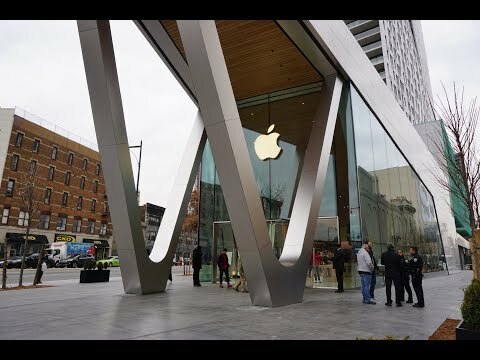 Ahead of its grand opening to the public this Saturday, AppleInsider took a tour of the new Apple store, located at the intersection of Flatbush Avenue and Ashland Place. Just steps from the Atlantic Terminal transportation hub, as well as the Barclays Center arena, it's a heavily trafficked corner -- and also a noisy one. Because of that, Apple went above and beyond to ensure that customers who come into the store feel right at home, in a comfortable escape from the bustling streets outside. Jason Barlia, market director for Apple's stores in New York City, told AppleInsider that the floor itself was engineered to be isolated from the rest of the building. That's because Atlantic Terminal is the intersection of five major subway lines -- something you can feel under your feet when a train pulls into the station. "Having an isolated floor minimizes any vibration that you might feel as a result of those things," Barlia explained. The store is designed not only to keep noise and vibrations out, but also to aid in the acoustics from within the space itself. Overhead is a sloping timber canopy, starting at about 30 feet high outside the store, designed to create what the company calls a "premium sound experience." "These wood panels have perforations that look, from the outside, like the character of the wood," Barlia said. "They actually have space in them so that the sound gets absorbed into them, but doesn't bounce back out of them." Despite the focus on peace and quiet, the location doesn't want to completely block out the surrounding busy neighborhood. Visually, downtown Brooklyn is in full display, with huge glass panels surrounding the store, blurring the lines between inside and outside. One of those massive windows shattered as construction was underway, forcing the company to special order new custom Sedak glass from Germany just a few weeks ago. When asked about whether the broken glass delayed the opening of the store, or how much it cost to have a massive replacement pane crafted, officials from Apple declined to comment. The new store at 123 Flatbush Ave. is also notable because it's the first in New York City to feature what Apple dubs the "Genius Grove." Potted ficus trees surround empty tables where customers will get help from Apple Geniuses by appointment and walk-in. Apple even brought the trees into the store early in the construction process to make sure they would acclimate to the environment. The downtown Brooklyn Apple store leader is Edwin Morales, who has been with the company for 8 years. For the last two years, Morales has been a store leader at the company's Pudong location in Shanghai, China. In all, the Brooklyn store -- Apple's second location in New York City's most populous borough -- will have 160 employees. Over half of them have moved to work at the location from other Apple outlets around the U.S.
To serve New York's international audience, the employees collectively speak 20 different languages. Apple Downtown Brooklyn opens this Saturday, Dec. 2, at 10 a.m. Members of the press were provided with t-shirts at Thursday's preview, and the first customers to visit Saturday's grand opening will receive their own. I guess they learned their lesson after their Palo Alto(?) store was unbearably loud. For a company many tech media experts swear is on the brink of a financial collapse, Apple sure keeps erecting plenty of "town squares" for consumers. It's good they're hiring plenty of employees considering how many other retail stores are letting go of employees. There's almost no reason for most New Yorkers to not have iPhones because there's so many Apple stores around. Customer service should be great and the classes Apple offers should be quite helpful. Congrats on getting a pre-opening tour, and nice write up. 80 people relocated to NYC just to work retail? That's almost hard to believe. Those pictures remind me of a Microsoft Store on a busy day. Looks like a reasonable investment in sustaining and advancing their incredibly valuable brand to me. There's no slinky cord under these, is this new ? That store design is stunning. Perforated ceiling for noise reduction. Isolated floor for vibration reduction. Does anyone know how the floor might be isolated? A slab on rubber feet? Or pneumatic cushion? One of the reps was showing me their headphone testing area, and there are drawers underneath for accessing things like AirPods and PowerBeats and what have you, but the drawers are actually locked by some form of NFC/RFID. The rep used an iPhone in a case to unlock the drawer. Since iOS 11 supposedly gives third-party developers some access to the Apple Pay NFC chip, but I haven't seen any real-life uses of this capability yet, I was curious. And certainly Apple would be able to provide their own in-store phones with access to the NFC chip. So I inquired. The phone was encased in what appeared to be a Mophie-like battery pack. And the rep showed me that it had a unique NFC/RFID chip cutout on the back of the case. That back corner needs to be placed in a specific spot to unlock the drawer. So no, oddly enough, they're not using the Apple Pay chip in the phone for some reason — they're relying on a case. Kind of reminds me when Apple stores used to check out customers with Windows Mobile-based handheld terminals, even though the iPhone and iPod touch were huge at the time. An odd omission for the company, and something of a missed opportunity to showcase the technical prowess of their devices. Anyhow, wasn't worth mentioning in the story, because those drawers are at many other stores. But figured I'd share here for those curious. Nothing stays the same. It either expands or it contracts. Apple is one shining exception to the overall trending collapse of brick and mortar retail. They have the wherewithal to expand, and they're doing it in their own unique way. It's both original and unprecedented. P.S. I love the interior trees! The tables are custom made. The cords are through the legs to the floor underneath directly. There is a gap inside the table for trenching, each to individual devices through a small hole under the device stands. They use to have that thick, black spiral cable under the tables, and then had where the cable came out of the leg near the floor. I'm glad they moved to a completely hidden setup. I suppose that's why there's a "grate" under each table so they can access the electrical going to each table, but I wonder if that's even necessary if they just planned for a proper, bespoke power cable in one leg and use giant pins for the three other legs to keep the "powered leg" from moving. The Lincoln Center, NY store is also unbearably loud. When SIRI was first released, I went there to try it out and it wouldn't work because there was too much noise. Then I heard this huge volume of music coming from the basement that sounded like a live band. I went down there and it was just some small speaker system reverberating around the floor. It's all those hard surfaces: concrete floors, glass ceilings, hardwood tables, stone walls and glass panels on the walls. IMO, it's not the noise of Flatbush Avenue that would have been the problem - it's the internal noise in the store. If what they've done to lessen the outside sound also reduces the internal noise, that would be great. Not that it really matters from a sales standpoint - they'll sell the same amount in the store no matter what. If anything, noise will probably get people to leave the store faster instead of hanging out and checking email and social media. It might be reasonable for an analyst to claim that Apple won't continue to grow at the same rate. But anyone who claims that the company is on the brink of a financial collapse is a complete idiot and fool. In 2016, Apple reported $216 BILLION in net sales and almost $49 billion in net income. The stock is at 172, down just a bit from its 52 week high (and I think all-time high) of 176.24. The market cap is $822 BILLION. But anyone in NYC who wants an iPhone doesn't need an Apple store. iPhones are sold in many other retail stores as well as the phone stores of Verizon, ATT, T-Mobile and Sprint and there's hundreds if not thousands of those stores in NYC. That's not to say that Apple shouldn't have opened the store. But it's more marketing and brand reinforcement than anything else. Having said that, Brooklyn should have more Apple stores. There's just two - this one and one in Williamsburg. There's over 2.6 million people in Brooklyn. And there's 2.3 million in Brooklyn. That's each larger than many other cities. Your post reminded me of an idea I had years ago. The article is specifically about the noise-absorbing glass, but I'm not sure it would work keep internal sound from bouncing off the internal glass—but maybe it would have a net benefit seeing as how Apple loves to use a copious amount of glass. My interest was with the piezoelectric material which I wonder if they could be applied to dentistry tools, or as a stick on pad or headphone-type mechanism that wil send counteracting soundwaves through the TMJ or mastoid process so that, at the very least, the sounds occurring in your mouth would at least be reduced. I never did follow up on it and had completely forgotten about this idea until now. My Dad is 87. He gets along pretty well in most situations, but he really can't stand to be in the Apple store at Barton Creek Mall in Austin. The noise and even the lighting is just a bit too much for him. I find it pretty loud and vibrant, but no so much that it bothers me. I fully understand the loudness thing though, as almost every restaurant I go into has become, over the last 10 years, almost completely unbearable. My understanding is that restaurant designers want the room to feel live and successful because people don't like gathering in quiet spaces. I'm betting Apple store designers look at their venues the same way - they don't want them to be quiet. Personally I think this concept is taken too far and with modern acoustical design some mid-range balance could be reached. Particularly in a retail space where conversation has a need to heard clearly and correctly in order to complete transactions. Removing the thick black coiled cable from each table looks 100x better imho, but the cables running from the device(s) to that gap in the centre looks equally naff. Sure, it lets you have a 1-table-fits-all (ipod/ipad/macbook) display but surely Apple can afford to not have such needless cost-cutting ideas imho. >>There's just two - this one and one in Williamsburg. There's over 2.6 million people in Brooklyn. And there's 2.3 million in Brooklyn. That's each larger than many other cities. I meant to write, "And there's 2.3 million in Queens....."